• My Ford pickup rear back glass window is leaking, Can Phoenix Glass solve the problem? Yes we can! Certain model year Ford mid and full size pickup trucks, weather it’s a stationary rear back glass window or a rear sliding back glass window, have at least 5 issues to take into account that require meticulous (anti-assume) diagnostic checks or you may end up spending your hard earned money fixing the the wrong problem. We’ve been asked this question so often that we’ve taken the time to devote an entire web page on the subject of Ford pickup rear window back glass leaks. • My Mercedes has a heated, laminated rear back glass window with a stone break similar to what I have seen in windshields, can it be repaired like a windshield can? Due to the method of manufacturing laminated heated back glasses cannot be repaired. Repairing this type of glass can result in serious personal injury. 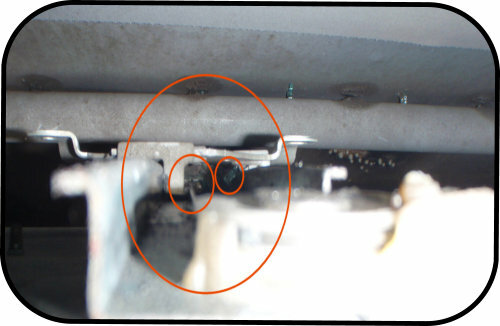 When the heating element is activated the repair can create a hot spot (or short) within the glass causing the glass to explode in that spot sending projected glass shards into the passenger compartment. • How do I know your installers are qualified? Your Phoenix Glass Auto Glass Technicians keep up with the times and have a high degree of understanding of the ins and outs of rear back glass window replacements. They are familiar with the proper tools, methods of removal, preparation of the pinchweld and possess the knowledge of the many different adhesives available that will provide the strength to hold the back glass in your vehicle. 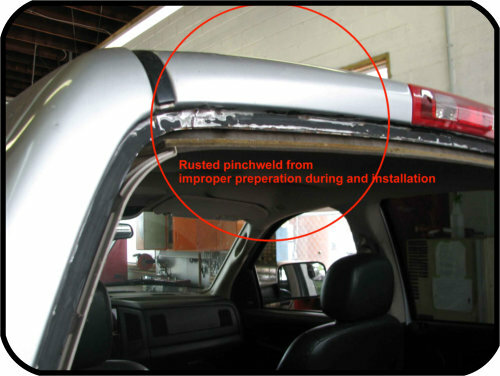 Along with all that they also understand and use the proper methods that prevent leakage and rust around the pinchweld where the auto glass bonds to the vehicle. Phoenix Glass technicians have as much as 42 and none less than 15 years of auto glass experience and have literally installed thousands of rear window back glass windshields. You can rest assured that your new replacement back glass will be properly installed to meet both FMVSS and AGRSS standards so that your vehicle will be restored to the factory specifications or better. • How soon can I wash my car after my rear back glass window is replaced? You can h and wash your vehicle as long as you keep high pressure sprays of water well away from the new back glass and moldings. Water or rain on the new replacement back glass installation isn't a problem at all, in fact the moisture actually helps the curing process of the urethane adhesive sealant. You should wait a minimum of 24 hours before washing your vehicle in a high pressure type of car or truck wash. A high pressure automatic car wash can damage the urethane adhesive seal of the new replacement back glass and outer mouldings before the urethane adhesive used in the new windshield installation has had a chance to sufficiently cure. It's also important to leave at least one of the windows open at least 2 inches to reduce the pressurization in the vehicle when the doors are shut and when the heat or air conditioning is operated for 24 hours. Having a window slightly open prevents the pressure build up from ambient heat on a hot day and the pressure the heater or air conditioner builds up inside the vehicle’s cabin from pushing a hole through the new uncured urethane seal which can cause an air or water leak. • How soon can I drive my car after my rear back glass windshield window is replaced? That will depend on the type of adhesive used to install the rear back glass in your vehicle. Rear window installations that use urethane rely on temperature and humidity to cure, the time required varies widely depending on the manufacturer. This time frame can range from 1 to 24 hours or more before your vehicle will meet Federal Motor Vehicle Safety Standards and is considered safe to drive. It's imperative that you follow the manufacturers instructions regarding safe drive away times. Not adhering to those instructions could result in your serious injury or even death. It is extremely important that the technician or company CSR replacing your back glass explain to you when you are able to SAFELY drive your car, truck or SUV. • After I have my rear back glass window replaced, how do I know it was done right? You don't! Without removing the rear window replacement back glass, it's impossible to tell if the back glass and pinchweld surface were prepped correctly, if critical primers and proper flash times were used, or even if the proper amount and type of urethane was used. 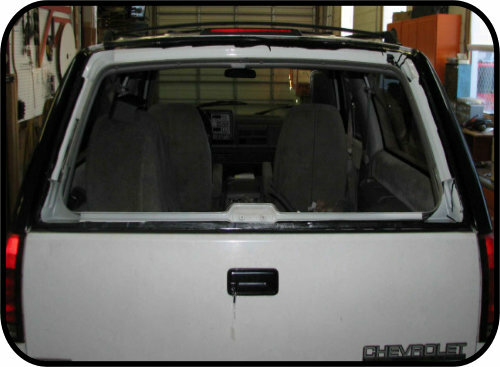 Once a replacement rear window back glass is installed all the critical installation preparation steps are hidden under the moldings and black ceramic band. If it looks like a clean back glass installation and the moldings are lying correctly you can only guess it was done right and in reality those things are only cosmetic, it's what is underneath and when and how it was done during the replacement installation process that counts. The only sure way to tell if a rear window back glass was properly installed is to crash test it, but we sure don't recommend it. The next best way to know is to know the reputation of the company that installed it. 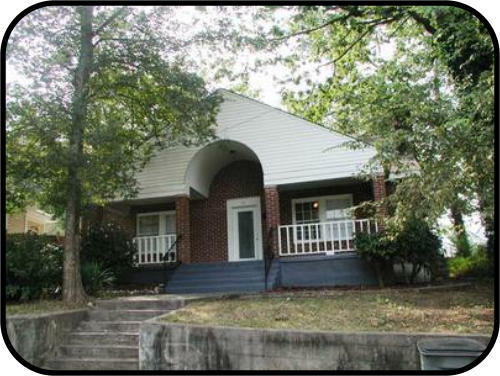 Make sure the company has an actual address complete with an actual store front as there are many gypsy type auto glass companies operating in and around Knoxville as well as it’s surrounding areas. No store front usually goes hand in hand with a pick up truck and a cell phone. You can easily accomplish this using Google Maps Street View . 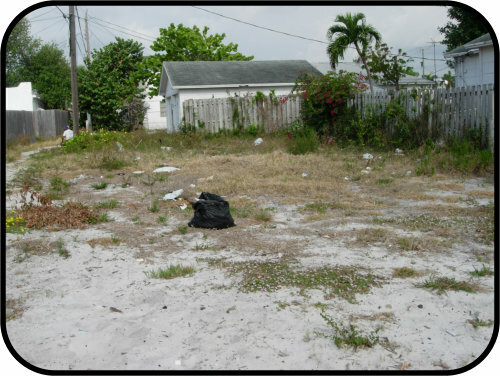 Google allows you to see if the company your considering using for the installation of your new replacement windshield turns out to be a home, an apartment complex or even an empty lot. With the power of the internet anyone can make a attractive website to lure you in. They typically have no liability insurance and when something goes wrong you are on your own since they are very difficult to track down and with the power of Caller ID they stop answering your repeated phone calls. Due to poor workmanship during the average month here at Phoenix Glass we re-do auto glass in about 6 vehicles per month from this type of so called auto glass company. By the time you add up the expenses of a new glass, mouldings and repairing the body damage that was done to the pinchweld the price for repairing a vehicle in this type of situation is usually 3 to 4 times what it would have cost if it were done right in the first place. Unfortunately most of these installers are or were employed and trained by some of the major chain outfits where they learned these corner cutting traits to make more money and actually have convinced their selves to believe that they are doing the work properly. Typically these employees are paid by salary plus commission. In slow times the employee gets the minimum pay to save the company money but when times are busy as an added incentive the employee is given a commission based on production. The more jobs completed the more pay received and the only way that can happen is by speeding up the installation process which is where something has to suffer in order to make that happen and it’s usually you and your vehicle. 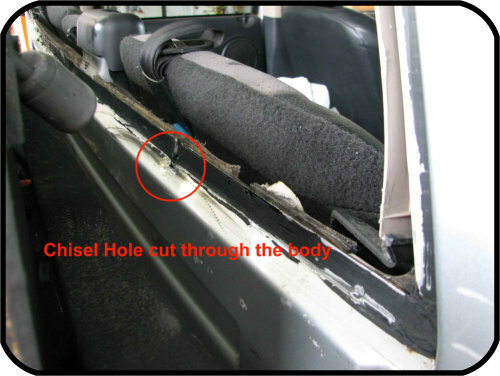 In the event these short cuts lead to a problem at the very least your going to loose some valuable time having your vehicle redone and at the very worst it can lead to serious injury or the loss of your life or that of someone you love so be very careful when choosing who you let install a rear back glass window in your vehicle. • If your rear back glass window has a cable type power window regulator the only sure way to remove all the broken tempered glass fragments is with compressed air. These rear back glass power window regulators are very similar to the door glass unit pictured to your left and have several places that the tiny pieces of broken tempered glass can fall into as well as grease points that lubricate the moving parts. When the glass is broken the falling broken tempered glass fragments will adhere to these grease points like a magnet and it only takes one tiny piece of glass to get caught and jam up the mechanism causing the rear back glass window regulator to break. We have seen some of these cable back glass regulator units c o s t as much as $600 dollars to replace so taking an unnecessary chance with these fragile cable type window regulators just isn’t a good way to go. 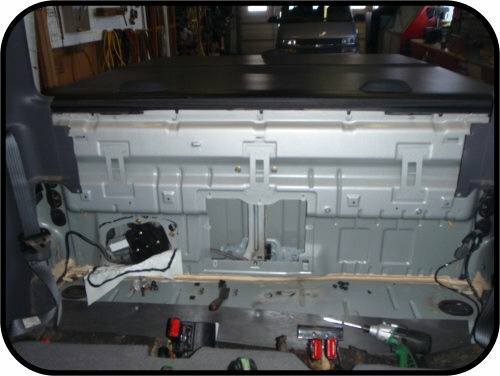 • Some hatch type back glass installations such as the GM vehicle pictured here have an open inner support skeleton that fills with broken tempered glass fragments and absolutely cannot be removed without the use of compressed air. If one small piece is left behind it can cause a minor rattle and worse yet there’s a possibility that it could work its way between the glass and the frame and cause the glass to stress break in the future. 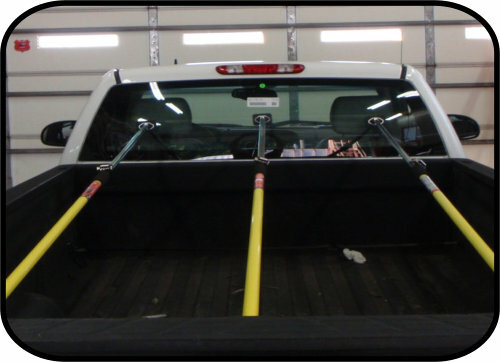 • Some rear back glass window replacements like this Ford Sport Trac do not have large enough access holes to the interior area of the rear cab panel that will allow a vacuum hose to pass through the entire range of the back glass cavity. In many cases the only access is through one small removable access panel opening and the only method of removing all the broken tempered glass is with the use of compressed air. 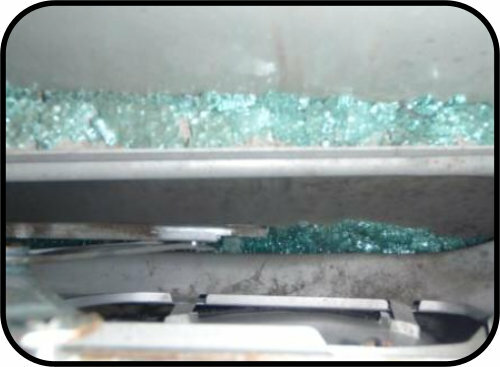 • When a van or lift gate type SUV rear window back glass breaks the tempered glass fragments fall inside the lift gate door and are captured within small pockets and can not be accessed directly by the vacuum and absolutely cannot be removed without the use of compressed air. • How long will it take to replace my rear back glass window/rear windshield? The time it takes would depend on the make and model of your vehicle. The average car or truck replacement rear back glass window windshield installation typically takes from 45 to 90 minutes. Installations that take longer than 90 minutes are what we classify as difficult installations that are not practical to do in the field and do not qualify for our mobile on site service. A difficult replacement back glass installation can take up to two highly experienced auto glass technicians working as a team from 2 to 4 hours to properly install a new replacement rear window back glass when everything goes by the book. A few good examples would be the Dodge and Ford full sized pickups and another would be a Ford Sport Trac. All 3 of these pickup trucks require a significant amount of time to replace a rear window back glass in as they must be meticulously done in stages working with the difficult to access fragile interior seats, trim, head liners and fastener parts that must be removed and replaced much reminiscent of a 1000 word jigsaw puzzle. • Most vertical set windows such as a pickup truck back glass may require being held in place by different manners and for many reasons (paint damage being the main one) need to be done at and remain in our service centers controlled environment until the adhesive cures for a minimal amount of time. • Does my rear window back glass help protect me during a collision like my windshield? A urethane bonded back glass contributes to the structural integrity of a vehicle just as much as the windshield. Typically it’s the windshield that is usually referenced when discussing maintaining vehicle strength and structural integrity but it also extends to the back glass and a urethane bonded side glass as well. Stationary glass in vehicles today add to the structural strength and rigidity of the vehicle body. If the glass is not properly bonded to the vehicle, it can alter how the structure reacts in a collision or even during normal body flexing and driving. There’s also a few vehicles in today’s world that have rear air bags and the deployment rate of an air bag can be altered by fractions of a second, where fractions count, resulting in slightly early or delayed deployments.